Notes | The Beatles racing across Candlestick Park at the end of their final public performance; Johnny Cash pausing to give the camera a middle finger salute before playing for inmates in San Quentin; a weary Janis Joplin backstage, keeping a whisky bottle company. Jim Marshall captured each of these iconic images with his camera. But what of the other shots taken during these legendary moments? For the first time, Marshall shares his contact sheets from the sittings, concerts, and sessions that surround his most famous pictures. Over sixty proof sheets are featured in their entirety, along with the final chosen hero shot on the facing page. 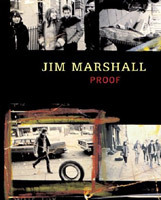 This book sheds new light on Marshall's talents for revealing on film the essence of his subjects, from celebrated musicians, actors, writers, and performers, to everyday people from San Francisco to rural Appalachia. A rare glimpse into a great photographer's creative process, Proof provides a behind-the-scenes look at the making of some of the most preeminent images of our time. Jim Marshall has more than 500 album and CD cover photos to his credit. His shots of Woodstock, the Monterey Pop Festival, the Beatles' final concert, and the vibrant youth culture of San Francisco in the 1960s are among the most iconic images of the era. He is the co-author of several books, including Monterey Pop, published by Chronicle Books. Comments | [05/05/05] I was browsing through the book once at some trendy bookstore on Sunset Blvd and found it quite interesting, what I liked even more was seeing the enlarged proofsheets (32"x40"?) at the Fahey/Klein gallery on La Brea in Los Angeles. Seeing them that big, along with the famous pictures (Joplin, Dylan, Beatles, Jimi, Santana, etc) really rocked my world. Comments | [09/23/04] Saw this the other night at the local Tower and it's a wonderful book, great moments and loads of great history. As an editor I loved the contact sheets on the facing pages. Need a Good Punch in the Face??? Click Here ::..